Grizzly Anti-Skid / 22 Lb. 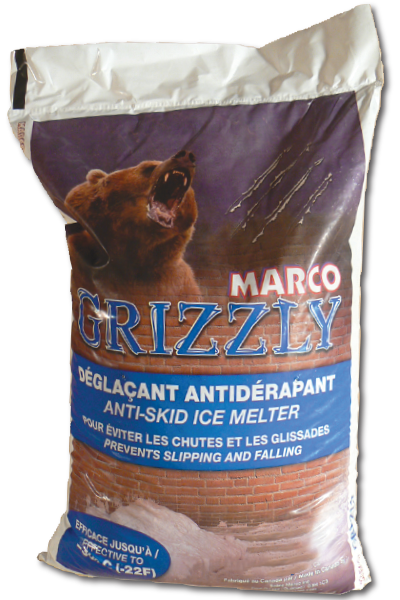 The Grizzly anti-skid ice melter is a blend of salt, calcium chloride and anti-skid stones. 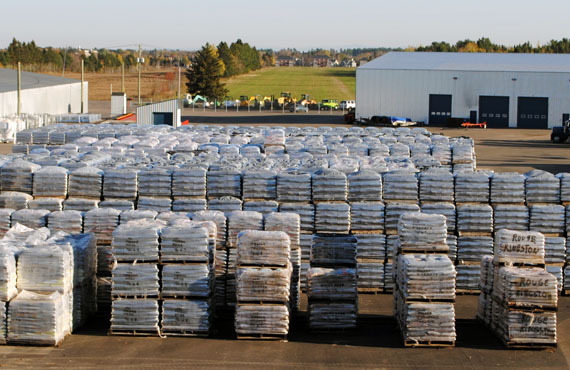 The combination of sodium and calcium produces heat to melt ice and snow while the anti-skid stones provide better traction. It is safe to use on steps, sidewalks and front entrances when used according to the manufacturer's instructions and on good quality air-entrained concrete. Reduces the risk of slipping and falling. + Harmless to the environment and concrete when used as directed. Grizzly Anti-Skid / 40 Lb. Grizzly Anti-Skid / 44 Lb. Grizzly Anti-Skid / 12 Lb. 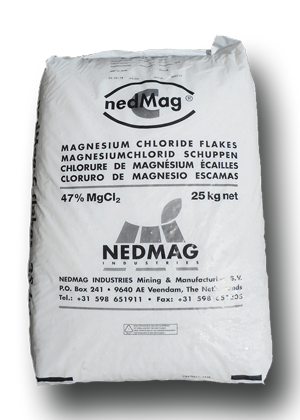 Calcium Chloride / 40 Lb. 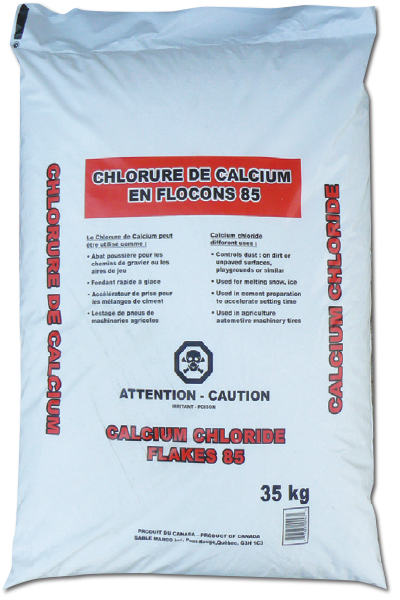 Calcium chloride is used in many ways, it is ice melt faster in winter, avoid dust summer accelerates decision cement mixes and serves Ballasting of tires. Specific directives are available for each application. 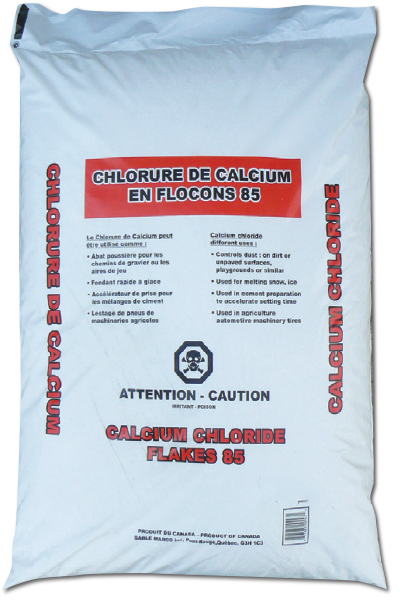 Calcium Chloride / 77 Lb. Melts ice rapidly on contact on steps, sidewalks and driveways. Effective up to -25°C. (-13°F). 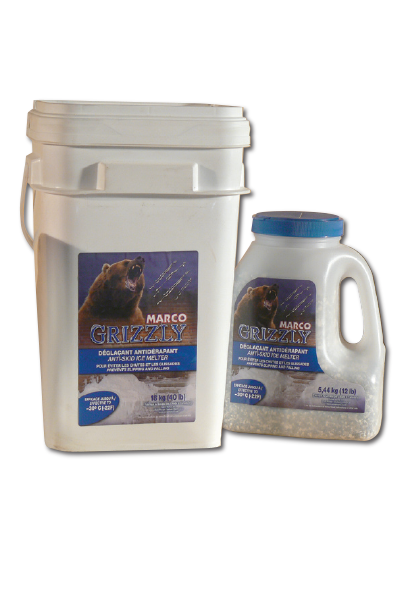 The Marco pet safe ice melter is an ice melter carefully formulated for the safety and welfare of your pets. Our pet safe does not contain salt or chloride, which can be harmfull for your pets paws and stomach. 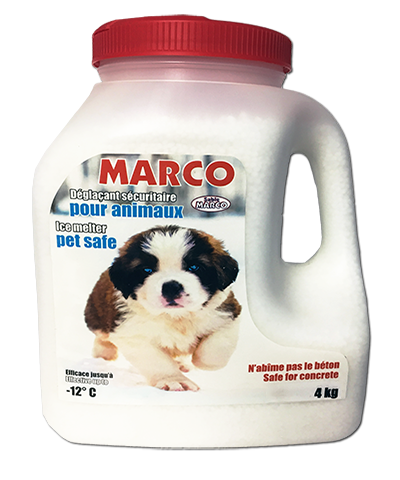 Furthemore the Marco pet safe ice melter is made of biodegradable products that will not damage concrete or asphalt*. The combination of solar energy and its componants make this product efficient up to -12° C.
Yukon Ice Melter / 22 Lb. The Marco Yukon fast-acting Ice Melter is a blend of sodium chloride and calcium chloride producing heat to melt snow and ice instantly in the most extreme winter conditions. 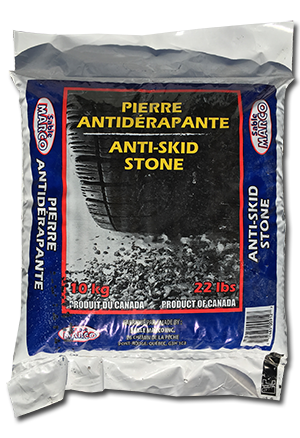 It is safe to use on steps, sidewalks and front entrances if used according to the manufacturer's instructions and on good quality air-entrained concrete. Yukon Ice Melter / 44 Lb. Yukon Ice Melter / 12 Lb. Much cleaner and easier removal after the ice has melted away. 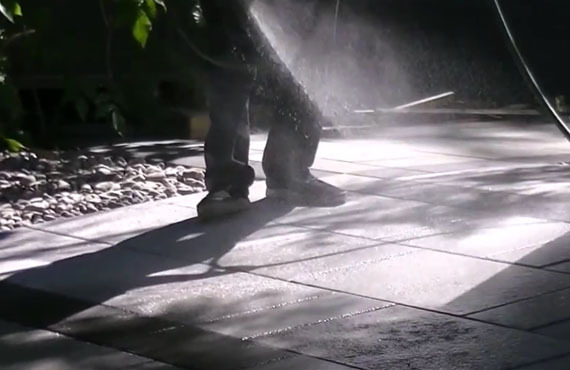 The anti-skid stone is specially used near the entrance of your home or business. 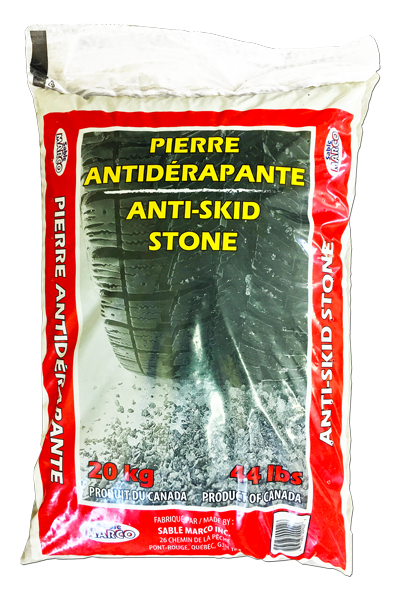 Ideal as an extra weight for the car, it can be used under the wheels of car to get out of icy spots. Salt & Sand Mix / 22 Lb.. Combined anti-skid and de-icing properties for better traction and ice melting. The 10 kg format is provided with a strong handle for easy carrying. 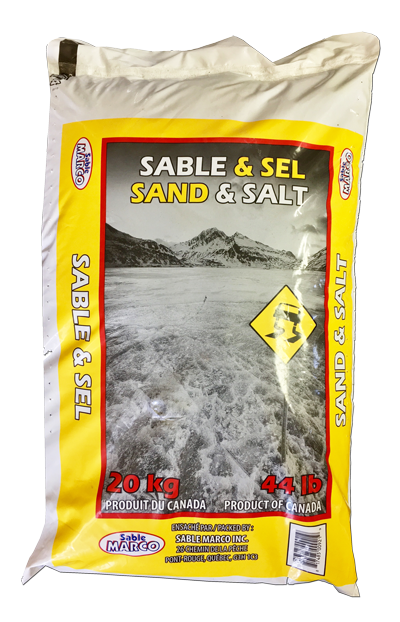 Salt & Sand Mix / 44 Lb. 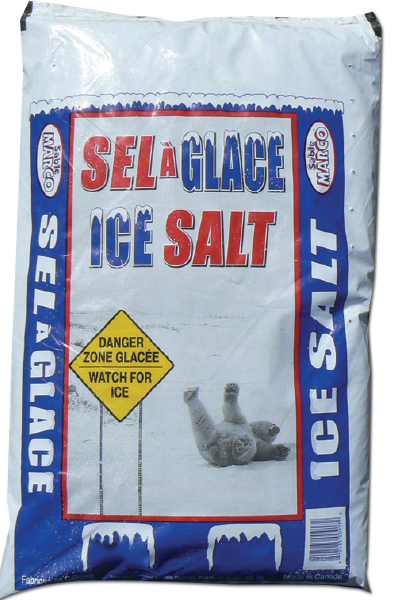 Ice Melting Rock Salt/ 22 Lb. Ideal for all ice melting applications. Various sizes of bagged salt available (sodium chloride) suitable for all uses. The 10 kg (22 lb.) format is provided with a strong handle grip for easy carrying. 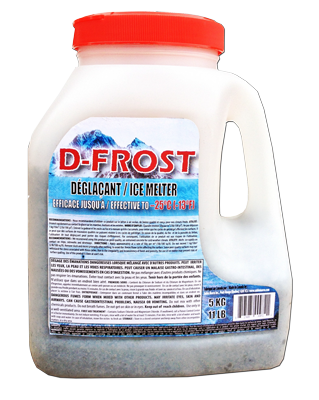 Ideal for all ice melting applications. Various sizes of bagged salt available (sodium chloride) suitable for all uses. Ice Melting Rock Salt / 44 Lb. Ice Melting Rock Salt / 88 Lb.